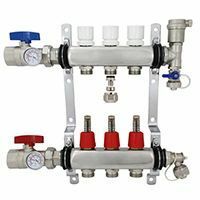 This category features manifolds for plumbing and radiant floor heating applications in copper, stainless steel and brass material types. Typical PEX manifold design consists of a trunk (main pipe) and outlets (branches) with connections adapted for connection of PEX tubing. When water enters the manifold, it’s distributed through the branches and travels to designated locations. Stainless steel and brass all-in-one pre-assembled manifold sets for radiant floor heating in 2 - 12-branch sizes with 3/8", 1/2" or 5/8" PEX or PEX-AL-PEX connections. PEX copper and plastic manifolds with or without valves for hot & cold water plumbing from leading industry brands, including Sioux Chief and Viega. The primary purpose of a PEX pipe manifold is to act as a distribution center in a plumbing or heating system. Select manifold types and models allow users to set up automatic flow control, monitor temperature and flow and much more. Manufactured manifolds save installers significant amount of time and help to eliminate leakages associated with manual assembly from individual components, such as fittings, valves, pipes, etc. In many cases, the cost of manufactured manifolds is less then the cost of such individual components, which further helps to increase savings. A classic hydronic type radiant floor heating system is comprised by (2) or more loops (circuits) of PEX tubing which are fed by the main hot water supply line from the boiler or other heating equipment. A PEX radiant heat manifold incorporated into this system helps user to balance the flow in individual circuits, achieving equalized temperatures throughout the zones. Optional manifold actuators can replace manual balancing valves and in combination with an external zone valve control device (such as Taco ZVC) allow to control the room temperature via the thermostat. Other components integrated into the manifolds’ design, such as shut-off valves, air vent and drain valves simplify the installation and maintenance process without the need for installation of separate costly components. PexUniverse sells a complete range of Everhot radiant manifolds. In traditional rigid pipe systems, water is delivered to the fixtures by branching off the main water pipe with smaller diameter pipes. The issue of such systems is a large number of connections concealed behind the walls and in the floor/ceiling, which take more time to make and present a potential leak problem. PEX plumbing manifold, installed in proximity to the hot or cold water supply, helps to eliminate these issues by allowing for a PEX pipe run from the manifold directly to the fixture with little or none concealed connections. PEX manifolds with valves (“valved”) or without valves (“valveless”) sold here are made in USA from type “L” copper and are fully compliant with “low-lead” regulations. 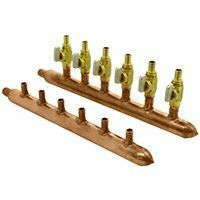 PexUniverse offers the largest selection of Sioux Chief copper manifolds online. Leading US PEX companies, including Watts, Viega, Zurn, Nibco, Everhot and others offer PEX products manufactured to the same standards, meaning that they can be used interchangeably. Radiant PEX manifolds by Everhot can replace similar products from the above manufacturers, as well as brands such as Uponor (Wirsbo), Caleffi, Mr. PEX and several others. Copper PEX manifolds by Sioux Chief are also capable of replacing the products made by mentioned, however, the type of connections must always be considered. PexUniverse sells plumbing manifolds with either standard crimp style or push-to-connect outlets. Main factors which influence the selection of a heating manifold include size of PEX pipe used for floor heating and the size of the heated area. For a typical slab heating system with 1/2" PEX spaced at 12" OC (On Center) and a 1,500 sqft space, the project would require about 1,500 linear ft of PEX. Since advised loop length for 1/2" PEX is 300ft, the project would require (5) 300ft circuits of PEX and therefore, a 5-branch heating manifold set (such as SSM005). Since hot and cold water plumbing requires separate PEX plumbing manifolds, they are sized and selected based on the number of fixtures as well as inlet and outlet pipe sizes. Larger manifolds can be used for whole-house plumbing, whereas smaller – for point-of-use applications. Select models have as much as 12 branches with trunk diameter of up to 2". Models with valves provide the user with ability to shut off the flow in the event of maintenance or repair. PDQ manifolds with push-fit connections allow to connect any brand PEX pipe without the use of tools.